Heinlein also pursued similar ideas a bit earlier in his 1940 novella Waldo, his story about, well, waldoes - he originated the concept as well as the term. A waldo is a remote manipulator that mimics human motion at larger and smaller scales. For example, waldoes that looked like mechanical hands that were six feet across could bend steel girders, as well as "tiny pixy hands, an inch across" used for miniature work. In his later work Time Enough for Love, he wrote about "ultramicrominiature waldoes" that could be used for gene surgery. 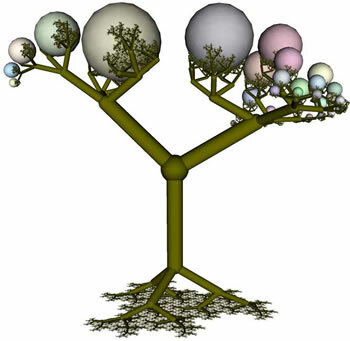 Roboticist Hans Moravec, working with sf writer Robert Forward, conceived of a more "fractal" version of this idea; a "bush robot" (also called a "Fractal branching ultra-dexterous robot") that literally had manipulators on its manipulators on its manipulators... you get the idea. Update: 09-Feb-2009 See the entry for Christmas bush motile robot for more information from Forward. The Christmas Bush can stick a "hand" inside a delicate piece of equipment, and using its lasers as a light source and its detectors as eyes, rearrange the parts inside for a near instantaneous repair. The Christmas Bush also has the ability to detach portions of itself to make smaller motiles. These can walk up the walls and along the ceilings with the tiny cilia holding onto microscopic cracks in the surface. For a bizarre illustration of both Heinlein's and Moravec's ideas that is perfectly suited to Halloween, see the Dactyl Fractal Zoom at Zapato Productions. A static sample is shown below. 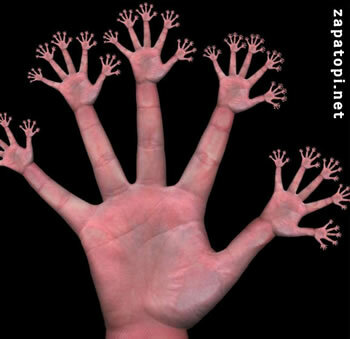 Be sure to see this finger fractal zoom for yourself (and check out the Zapato Productions homepage). Find out more about Robert Heinlein's waldoes; see more on Hans Moravec and bush robots. Found this one on Posthuman Blues.